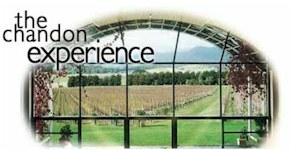 Based at the Green Point winery operations located in the Yarra Valley, viticultural region which enjoys a wide range of cool to cold climate vineyards, ideal for sparkling wine production. The group of wineries was brought together as Chandon Estates in 1997 and formed a division of Moet - Hennessy. The winery is also well situated to draw fruit from other cool climate vineyards throughout Tasmania, Coonawarra, the Strathbogie Ranges and the Victorian Alps. Domaine Chandon produces premium quality Methode Traditionnelle sparkling wines from Chardonnay, Pinot Noir and Pinot Meunier. A jewel in the crown of the Yarra Valley, one of Victoria’s premier tourist destinations, Domaine Chandon has been inducted into the Victorian Tourism Hall of Fame, having won the Winery Tourism category three times. Visitors to the estate experience the winery, the bottling line and the riddling hall, each location explained by informative notes and stunning photography. Visitors can be accompanied by a guide, to receive a complete and fascinating insight into the world of sparkling wine production. When Moet & Chandon purchased the Green Point property, the original homestead, built around 1880, was renovated and a purpose built winery located next door. Originally a mixed farming property, Chandon and the Green Point winemaking operations are located in lovely grounds amongst the vineyards, enjoying spectacular views across the valley to the mountains. The Colonnade linking the winery to the visitor's centre, with its distinctive link arches, was architecturally inspired by the Chateau of the Champagne Houses of France. The winery was purpose built to architecture which is a marriage of modern, and the traditional Champenoise. In addition to the Yarra Valley vineyards, Domaine Chandon Australia has established a forty hectare vineyard on the remote, and very cool Strathbogie Ranges, about 150 km north of the Yarra Valley Vineyard. The Strathbogie Vineyard is planted to Chardonnay, Pinot Noir and Sauvignon Blanc, and is called upon to provide distinguished batches of fruit, from highly specialized sparkling wine vineyards, to embellish the superb Chandon Cuvées. Grapes sourced at the Strothbogie site are of world class and yield exemplary varietal wines. A wide range of styles are produced, including the Vintage Brut, Rose and Blanc de Blancs, three distinct styles which exhibit complexity from three years ageing on yeasts in the bottle. The immensely successful Chandon Vintage range was launched in 1989 and is now established as a leader in the Australian market. It has also been very successful in export markets, particularly the UK and Japan. The NV Brut is a recent inclusion to the range and has become Chandon's volume leader. The classic Pinot Noir Chardonnay, Rose and pure Chardonnay non-vintage Brut are fresh, lively styles distinguished by a complexity derived from the inclusion of Reserve wines (base wines of older vintages that are aged in tank or under oak. The Cuvee Riche is a luscious high doseage sweeter style. Green Point Cuvee, Chandon's prestige sparkling, is a very long yeast aged wine (five years) made from the finest Pinot Noir and Chardonnay base wines. A Sparkling Pinot Noir Shiraz expresses the Australian classic style through an unusual blend of seldom matched varietals. Domaine Chandon's viticulture and winemaking are aimed at drawing on the strengths of Australia's finest cool climate vineyards, producing the best quality sparkling wine through the Methode Traditionnelle. The Chandon winemaking team, with great patience, perception and innovation, continue to produce an elegant and market leading style of sparkling wine. Chandon sparkling wines have received various awards over the years including Sparkling Wine of the Year at the UK Wine Challenge, and Penguin Wine Guide Australian Sparkling Wine of the Year.